All questions are answered by John on behalf of the other band members. A. Blendre is an original music playing, three piece band. Q. How do you pronounce the name, Blendre? A. Like the household appliance, the blender. the name. 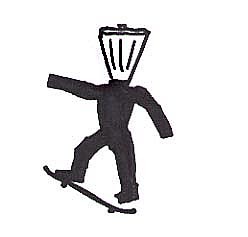 He was inspired by the skater, Neil Blender. to blend each members vision and talent. Q. How would you classify Blendre's music? Q. Are you guys a signed or unsigned band? A. Ask us this question again after September of 2003. Q. Where do you rehearse? in Jersey City, New Jersey, USA, Earth. A. We all live in the New York City area. Q. How do you feel about stalkers? A. We don't mind them, as long as they have nice legs. Q. Who are your musical heros? Rush, Faith No More, to name a few. Q. What is the fastest animal? Q. Who is the oldest and who is the youngest member? A. John is the oldest and Adam is the youngest. Q. Are you guys pro-drugs? have left the days of using behind us. Q. Are you guys vegetarians? Q. What is the best veggie burger? never be able to fit one in their ship. Q. How do you guys feel about the internet? Q. Do you answer fan email? A. Yes, each and every one. Q. How often do you update your web site? A. As much as time permits. Q. How do you go about choosing the pictures for your Gallery? hold a special place in our hearts in one way or another. Q. What is each member's fav Blendre song? shame to our family. Then we'll disown them. Q. Where can I get a CD? for details on how to get a hold of one. Q. Where has been you favorite place to play? especially look forward to playing CBGB's. Q. Do you keep in touch with your past guitarists? he's very supportive of us as we are of him. forward to adding to that list. Q. Why do dogs feet smell like Doritos?